ABB is presenting its ABB Ability mobile gas leak detection system. Designed to be 3,000 times more sensitive than existing methods of detecting leaks, the handheld device works by using ABB’s patented Off-Axis Integrated Cavity Output Spectroscopy (OA-ICOS) technique giving operators much greater confidence in the readings as well as providing a solution that is simple to use. Existing gas leak detection systems have relied on the units having contact with the ground and measure the gas in parts per million (PPM). ABB’s new system is not only faster at detecting leaks without the need to be in contact with the ground, but is so sensitive that it measures gas in parts by billion (PBB). 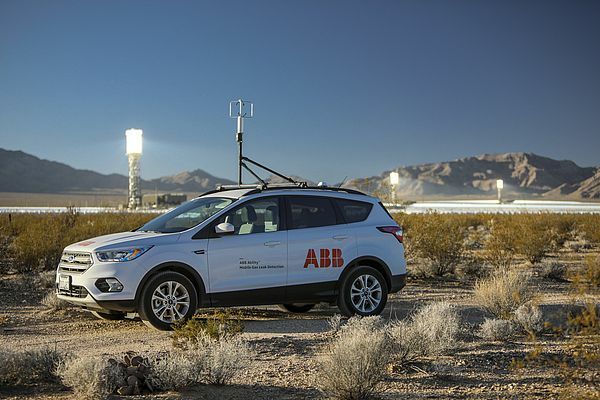 The car-based system consists of ABB’s methane/ethane analyzer, a GPS, a sonic anemometer and proprietary leak detection software that presents real-time geospatial maps of multiple gas concentrations in real time. The software’s sophisticated leak detection algorithm combines the system’s measurement of gas concentrations (CH4, C2H6), local coordinates (GPS) and local wind velocity (sonic anemometer) to estimate the location of the leak. Readings are stored in the device and can be transmitted in real-time to the cloud for centralized monitoring. ABB’s Neil Shah discusses key issues faced by users of device management tools and how Field Device Integration helps address them. Tank storage companies cannot afford to have leaks as a result of ageing assets or corroding tanks. To meet increasing safety and environmental regulations and to avoid huge fines, Belgian tank storage specialist ADPO relies on third party inspection. Safety relays play a key role for the high demands of switching in industrial applications already. With a view to increasing the availability of safety functions, Pepperl+Fuchs has introduced a range of different design features.